Show off your unique style and flair with a custom Etsy banner! With over 100 free layouts to choose from and a library packed with awesome images, it’s easy to create an amazing Etsy banner in Canva. Create an Etsy banner bursting with personality! Whether you use Etsy to sell your handmade or vintage items, art or supplies – Canva’s Etsy banner layouts will reflect your personality and charm. Our team of awesome designers work hard to create layouts that are original, diverse and most of all – inspiring! Simply drag-and-drop your favourite images, and change the colors and text to suit your style. For a custom DIY banner your fans will love, look no further than Canva’s Etsy banner maker for your design needs. It’s easy to create an awesome Etsy banner in Canva! Just got your Etsy profile up and running? It’s an exciting project to take on! Don’t worry if you don’t have any graphic design experience or a huge marketing budget, Canva’s Etsy banner maker makes it easy to create awesome looking graphics in just minutes. Head over to Canva’s homepage to discover our awesome library of layouts, created by professional designers. They’re free to use, so all you need to do is customize the images, fonts and colors you like to create an incredible Etsy banner that will impress your audience. Show off your arts and crafts projects by uploading your own images to Canva. It’s free to upload as many images as you like. If you want high quality images to use, check out our library of over 1 million images, graphics and illustrations. Many of these are free, while others are all priced at just $1. You won’t need to start from scratch every time you create a new Etsy banner in Canva. Every time you create a design, it will save to your Canva homepage. To create a fresh new banner, all you need to do is drag-and-drop new images, and change the text. It’s that easy. And if you want to grow your Etsy business further, we have all the design types you’ll need to promote your business. Create custom posters, flyers, business cards, brochures and beautify your Facebook page, Twitter and Google Plus profiles. There’s no need to download or install anything to use Canva on the web. Simply head over to www.canva.com and create an account online to get started. 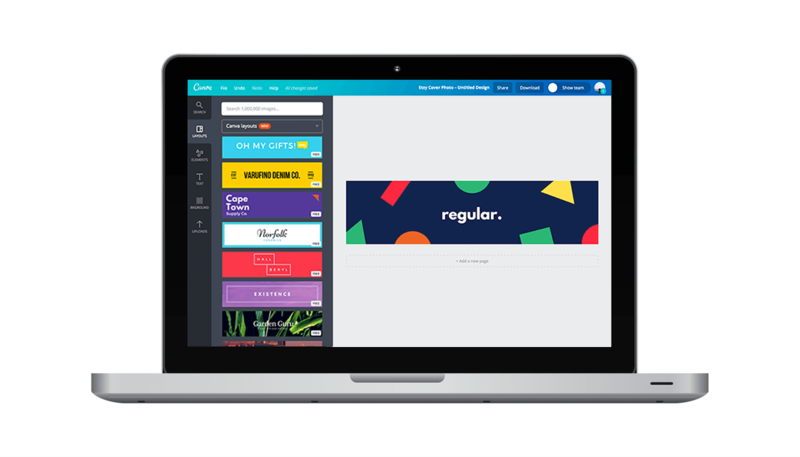 Alternatively, you can download Canva on your iPhone, iPad and Android devices for free, allowing you to create designs at home, at work or on the go!